If you believe in angels, you're in good company. 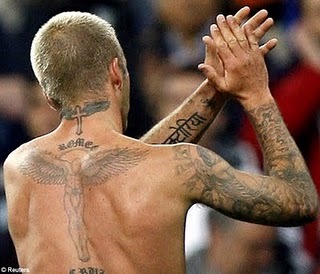 Just look at the celebrities who wear angel tattoos: David Beckham, Justin Timberlake, David Blaine, Beyonce Knowles and many others are engraved with angel art. 80s punk singer Toyah Wilcox is reported as saying that she is a firm believer in angels, as is TV presenter Myleene Klass who said recently that she feels that her guardian angel energy is motherly - like a total unconditional love! Lots of stars also wear angel jewellery - or give it to others as good luck charms. Actress Sandra Bullock could have worn anything to the Oscars but she chose a good-luck bangle that incorporated a guardian angels. Geordie Cherly Cole, is another fan and believes that 'someone' upstairs' watches over her. She's been spotted wearing bracelets incorporating cherub and angel wings too. She also gave X factor winner Alexandra Burke a very special necklace with a design of angel wings and a garnet stone. Meanwhile, Cameron Diaz says she's believed in angels since she was a young child. She feels they're with her all the time - they very possibly are!